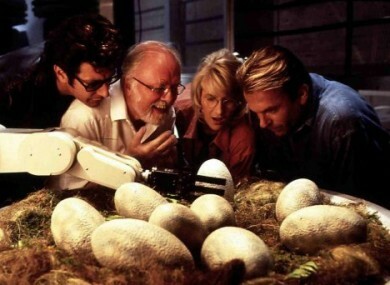 The fossilized eggs were being held by a collector. .
Dinosaur eggs in Steve Spielberg's Jurassic Park. CHINESE POLICE HAVE arrested a man accused of stealing dozens of fossilised dinosaur eggs, but some eggs are apparently still unaccounted for. The man surnamed Wang allegedly stole 80 of the eggs from a collector in the eastern province of Zhejiang on the night of 9 January with the help of three accomplices, the official Xinhua news agency reported. Wang had previously visited the collector twice under the pretext of wishing to make a purchase, the report said. The four suspects divided the eggs between them and Wang took home 27 of them. Those 27 fossils were recovered by police after they arrested Wang in his home town in Huanan county in Heilongjiang province on 4 March, provincial police said in a statement. Wang’s three accomplices were also soon apprehended, according to the statement. It did not say what happened to the rest of the eggs. Contacted by AFP, Heilongjiang police confirmed Wang was in police custody but refused to confirm the status of the other suspects. There have been numerous similar previous finds in China. The southern city of Heyuan set the world record for the largest collection of dinosaur eggs, with nearly 17,000 found in the city since 1996 when a group of children playing on a building site came across some fossils. In December 2015 US police returned to China an illegally imported dinosaur bone fossil believed to be about 120 million years old. Email “Chinese man arrested for allegedly stealing 80 dinosaur eggs”. Feedback on “Chinese man arrested for allegedly stealing 80 dinosaur eggs”.